After reviewing over a hundred squirrel proof bird feeders and hand-picking only the best ones to be presented on this website, I am truly surprised and honestly touched by the noble cause behind Squirrel-X bird feeder sales policy. "A portion of every purchase is donated to a bird habitat and conservation"
Honestly, I can't remember I've heard anything that comes even close to this. That's why I think Squirrel-X is the noblest squirrel proof suet feeder available for online purchase. By buying this fider people are helping wild bird feeding nationwide. It's no wonder so many people are engaging philanthropy. Besides, it's both affordable and pretty solid in terms of squirrel resistance and weather durability as stated by well over 600 previous customers. 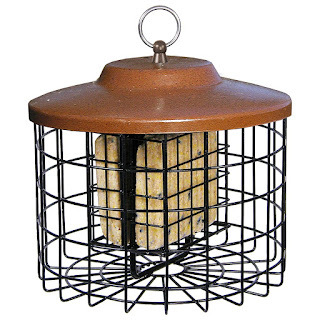 Squirrel proof suet feeders are caged bird feeders that use cage as a physical barrier to prevent squirrels and big birds like blackbirds from stealing small birds food. The logic is simple: only the small birds can get past the cage bars and reach the food (as shown in the photo above), while the squirrels can't. Possibly the biggest advantage of suet feeders is compact suet texture that's less likely to spill around the feeder than a bird seed food. This way the squirrels and the other uninvited animals will not get accustomed to camp underneath your bird feeder waiting for the crumbs to fall to the ground. But just in case they get attracted to the feeder, you can chase them away in no time using squirrel proof suet food and that's the bird food squirrels hate. 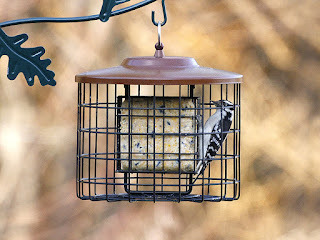 Suet feeders may have up to four suet slots. For example, Squirrel-X has two suet cakes capacity. Another great advantage of suet feeders is sturdy construction. Steel construction with no plastic parts is completely safe against squirrels teeth. Also, the weather durability of these feeders is really awesome as the cage bars are coated with rust resistant colors. And in the end, each and every caged suet feeder is real workhorse and requires no special maintenance except for the cleaning. How and where to hang squirrel proof suet feeder? Proper hanging of suet bird feeder contributes to its squirrel proofness in a huge way and it's truly important to understand that not just sued feeders but all of the anti-squirrel bird feeders depend upon the right choice of placement. Good practices of hanging suet feeders are no different from hanging any other squirrel proof bird feeders. But, going into depth here is way beyond the scope of this post, so I strongly recommend you should read my squirrel proof bird feeder tips. You'll find plenty of useful tips for placing bird feeders there. Where to buy suet cakes? In case you are not sure how to make suet cakes on your own, you can always rely on Amazon suet cakes offer. There's plenty of blends there you can choose from, indeed.